In a large saucepan. combine the corn syrup, sugar (or Splenda), and light margarine together. Heat over medium high heat and bring to a boil. Allow mixture to boil for 2-3 minutes, stirring as it boils. Remove caramel from the heat, add vanilla, baking soda, salt. Pour Rice Chex™ and pecans (and coconut, if you please) in a large bowl. Drizzle caramel mixture over the cereal. Toss to coat. Allow the mixture to cool for 3-5 minutes, then press it into 8-10 3-inch balls. Cool completely before biting right in! Caramel, pecan, and pure yum! 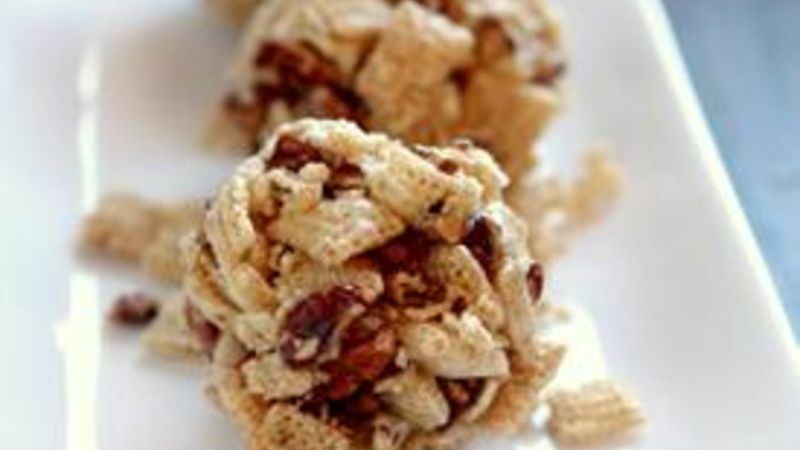 These fabsie Crunchy Munchy Balls are a snap to make and eat! There's nothing like a bit of caramel and pecan to make you feel like you've been downright sinful. But this recipe keeps your indulgences totally sweet! Here's how to make these yummy snack balls, which add up to about 200 calories per serving. Get yourself a box of Rice Chex quick! Mix up a simple vanilla caramel sauce from light corn syrup, shuga, and a wee bit o' finger licking, and you've got an indulgent dessert that is diet-approved! Toss the Chex into a large bowl with some pecans. If you're feeling feisty, add a bunch of coconut and go wild and crazay. Pour that vanilla caramel right on top of your Chex and stir it all together to coat. Taste tests are imperative at this point. Let this mixture sit just a bit to cool that caramel down so it sticks easily into fabulously crunchy treats!